If you’re a fan of Boston sports then you probably have some thoughts on the local sports radio stations around here. Personally, I don’t HATE them, but man can they frustrate me. I guess that means they’re doing a good job, because it gets me to tune in. A buddy described it best once when he said roughly 75% of what they say is true, but there’s always the other 25% that is just plain bananas and leaves listeners with a headache. One of the stronger hot takes they had this past off-season was about a 30-year-old DH/outfielder named Julio Daniel Martinez. If you recall, Martinez signed late in the off-season. It was all part of the negotiation process. JD’s agent, Scott Boras, wanted more money. The Red Sox knew he didn’t have many other suitors. That’s why Boston was able to eventually sign him for the very reasonable price tag of five years and $110 million (with some opt outs mixed in). Incredibly, sports radio took the delayed signing to mean that Martinez “didn’t want to come here”. I haven’t listened much lately, but boy do I hope they are eating their words. JDM has been nothing short of absurd in his first year with the Red Sox. Last night versus the Astros he hit his MLB-leading 19th homer, an opposite field line drive that Martinez was somehow strong enough to knock outta the park. The homer was symbolic of JD's overall season. We knew he was a power hitter before coming to town. Martinez posted a .714 slugging percentage last year, which was higher than Giancarlo Stanton's. But what has been so cool to see is how complete of a bat he is. He can pull the ball for power. He can go oppo. He can hit for average. He can drive in runs. He can get on base. Martinez was released by the Astros four years ago and since then has committed himself to the launch angle revolution. He's a student of hitting. He knows what he's doing. So far, the stats back it up. My goodness do the stats back it up! JDM began the year innocently enough, hitting .352 with five homers in April. Then he dialed it up in May, belting 13 homers while driving in 25 runs in 28 games. Now let's look at his season long numbers. Again, along with the LEAGUE LEADING 19 homers, Martinez leads baseball in RBI (48) while ranking third in OPS (1.042) and SLG (.664). Oh, and he's hitting .318 overall. Complete. Hitter. His season obviously seems like it’ll be deserving of plenty of recognition. For example, perhaps he gets the start at DH for the American League in the All-Star game. While this seems like a no-brainer there are already people calling for two-way sensation Shohei Ohtani to get that nod. I get it. I want to see him play in the ASG too. I think he should both hit and pitch in it. And while he’s been great he just hasn’t had the same impact JDM has offensively. Ohtani has appeared in just 31 games as a hitter thus far, roughly half of the 55 Martinez has started in. The ASG lineups are determined by fan vote, meaning Ohtani might get the start. Even if he does, don’t let that distract you from how dominant Julio Daniel has been this year. Believe it or not sports radio might’ve been wrong about him. Turns out he's pretty good. My goodness what a year 2017 was for Chris Sale. What a season for the most exciting Red Sox pitcher since Pedro. What a way to live up to expectations, and in many ways even exceed them. Chris Sale was awesome in his first year in Boston. You've seen the numbers plenty of times by now, but in case you forgot Sale went 17-8 with a 2.90 ERA and 308 strikeouts in 214 1/3 innings pitched. He led the league in innings, strikeouts, FIP, and K/9. He finished second in the Cy Young voting. He became the first pitcher to strike out 300 in the American League since 1999 (guess who). He was everything we could have realistically hoped for. So why…why doesn't it feel that way? Look no further than October. The past two years have been two of the strangest for me as a Red Sox fan. Is this a likable group of players? Are they unlikable? Is David Price a leader? What was wrong with the clubhouse last year? We're back-to-back division champs, winning 93 games both seasons, but are 1-6 in the playoffs. And just like I said in my blog last year, what the Chris Sale era means for Boston, this is a city that demands championships. This is the part where I mention that the early playoff exit in 2017 obviously can't be blamed entirely on Sale, even though he struggled in the second half and REALLY struggled in Game 1 of the ALDS. The Sox had plenty of problems last year. After Sale we didn't have a reliable number two starter. We missed Papi even more than we thought we would. Hanley Ramirez didn't show up. Mookie Betts, Xander Bogaerts, and Jackie Bradley Jr. all had "down" years. Not to mention we ran into an absolute buzzsaw in October called the Houston Astros. So yes, Sox fans have been left wanting more lately. I think it's because we know how good we can be. Even though Sale, Betts, Price, Hanley, Bogaerts, and Craig Kimbrel have all been awesome at times, this group has yet to come through when it matters most. The good news is we are still young. The bad (?) news is we don't have all the time in the world. We are right in the middle of the "Chris Sale Era". Kimbrel and Drew Pomeranz are free agents after this year. Price has the opt out. Sale and Bogaerts are free agents after next year. Mookie the year after. Time is kind of running out. Still, Andrew Benintendi and Rafafel Devers will be around for a while, but this really all comes back to Sale. He's either our best or our second best player. The way pitchers can take over in October he might be our most important one, though. We need more from him than he gave us in ALDS Game 1. We need more from everyone come this Fall. This group is young and talented but it won't be around forever. 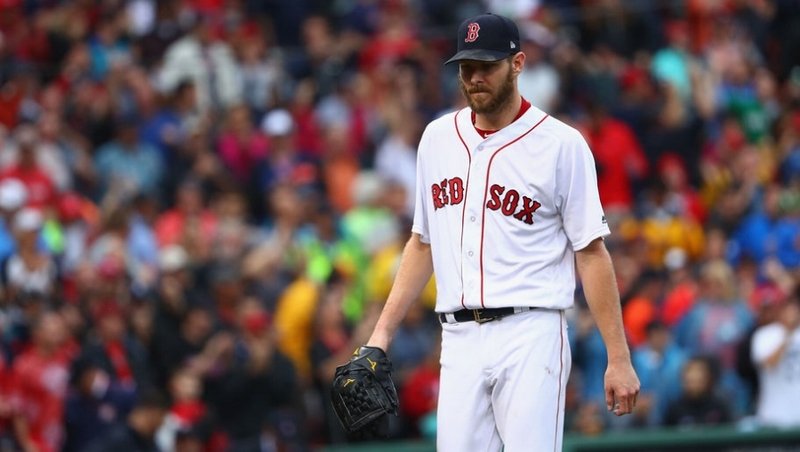 We need to take advantage of the Chris Sale Era. This move happened so early in the off-season that it's getting forgotten. Particularly in Year One a new manager can absolutely have a big impact and change the culture around an organization. Just look at what John Farrell did in 2013 to help rid the stink of Bobby Valentine. Obviously by 2017 Farrell wasn't the guy for this team anymore, and I give ownership credit for making a change despite the back-to-back division titles. Who doesn't like Cora? He's young, he uses analytics, he comes from a winning organization, he has played in Boston before. The list of positive traits this guy possesses goes on and on. However, what I reallllly like about Cora is that he learned what it means to be in the dugout last year as bench coach of the Houston Astros. Compare that to someone like Aaron Boone, who is coming straight from the broadcast booth, and I think it's a much better hire. Look, if the Sox have themselves a successful 2018 season nobody is going to credit that to bringing these two back, but each of them absolutely serves a purpose on this club. Also he might be our top lefty outta the pen this summer. As for Nunez he should be playing a super utility role in the infield. If Pedroia opens the season on the DL Nunie is our second baseman. He can also spell Bogaerts and Devers at short and third whenever they need a day. It would be unfair to expect Nunez to hit the way he did when he first came over last season, but he's a solid bench player and brings some edge/intensity to this group. We all know the Red Sox ranked last in the American League in homers last year. JDM hit 45 in only 119 (!!!) games. Nobody on Boston even hit 25. Before signing Martinez we had nobody who really scared an opposing pitcher. Now we do. Even the presence of JDM will probably make everyone around him better. Where JDM hurt his team was in the field, but luckily he'll mostly be DHing for us. This is a Red Sox team that won the division last year. We had "down years" from Mookie, Bogaerts, Bradley and Hanley. Now we brought in Cora and signed JDM/ Price should be healthy and we'll have a full year of Devers. We had an A+ off-season. Be excited, Sox fans. Can We Not Give The Yankees The Division Just Yet? 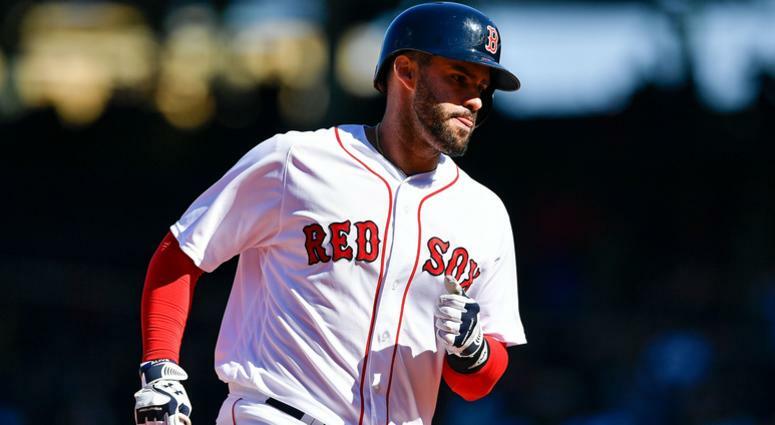 The Super Bowl has come and gone, which means it's time to really start digging into how the Red Sox are looking heading into 2018. Despite being back-to-back division champs the New York Yankees are the favorites to win the American League East this year. As they should be. This is a New York group that made it to Game 7 of the ALCS in 2017 (and actually had a 3-2 series lead that they blew, which people forget). They have the reigning Rookie of the Year winner (and MVP runner-up). They have a soon to be 24-year-old ace who just finished third in the Cy Young voting. And oh yeah, this winter they traded for a guy who hit 59 home runs a season ago. Welp. 1. It's true that the Yankees are the AL East favorites, but let's not act like they're perfect. For starters (pun intended) their starting rotation is very much up in the air. What they do have is an ace, a legit top-10 pitcher in baseball in Luis Severino. In his age-23 season last year he had a major breakout, finishing with a 2.98 ERA and 230 strikeouts in 193 1/3 innings pitched. He passes the eye test, the advanced stats back up what he did last year, and he's probably going to be the team's Opening Day starter. What they don't have is reliable starters to follow him. Sonny Gray posted an average 3.72 ERA in 11 starts after being acquired from Oakland mid-season, Masahiro Tanaka's elbow could fall off any day now, and CC Sabathia is going to turn 38 this season after (probably) over achieving in 2017. That group doesn't scare me one bit. You compare that to what the Sox *could* have (Sale, a healthy Price, Pomeranz, a Porcello bounce back, a healthy E-Rod) and all of a sudden Boston has the clear edge. It's assuming health, though, and the Yankees could still make a move for a front line starter, either soon or come July, but right now give me our rotation over theirs. 2. It's easy to forget now, but before 2017 Giancarlo Stanton wasn't GIANCARLO STANTON. Don't get me wrong. He was still insanely good, finishing second in the MVP voting back in 2014. But 2017 was the breakout we were always hoping for from him and 59 homers later he won that NL MVP. And now he's a Yankee. The question I find myself asking this winter is was this just a career year for Stanton, or a sign of more to come? These days accumulating 5 WAR in a given season is the new baseline for what makes a good player. Kind of like what hitting .300 used to mean. Stanton last year put up 7.6 WAR, which is great, but it's just the third time in his eight year career he's posted at least 5 (6.5 in 2014, 5.5 in 2012). A part of that is injuries. In the six year stretch from 2012 to 2017 Stanton appeared in at least 125 games just twice. Now, maybe all he needed was sustained health to do what he did last year, or maybe it was just one insanely hot stretch in August that he won't ever be able to repeat. If that's the case the Yankees still added a great player this off-season, but I'm not yet convinced they acquired an annual MVP front runner. We'll see. 3. Is Aaron Judge good or great? I know, I know. He's probably at least good, but his rookie season was so inconsistent (both good and bad) that we really can't be certain what to expect from him this year. We know the story. He started hot, then got REALLY HOT. but then he struggled after the All-Star break, batting an alarming .185 for 55 games. Then he got hot again. Even with that slump Judge had a historic year. He won the HR derby. He won AL ROY. He broke Mark McGwire's rookie home run record. When he was hot he hit dinger after dinger after dinger. As a Sox fan it was frightening. It still is frightening. But I bet that slump is just as frightening for Yankee fans. 55 games is...enough to make you think. He'll probably be great, but Mookie Betts has taught Boston fans following up a breakout isn't always easy. Let's just see Judge do it once more before assuming he ever repeats 2017 again. 4. 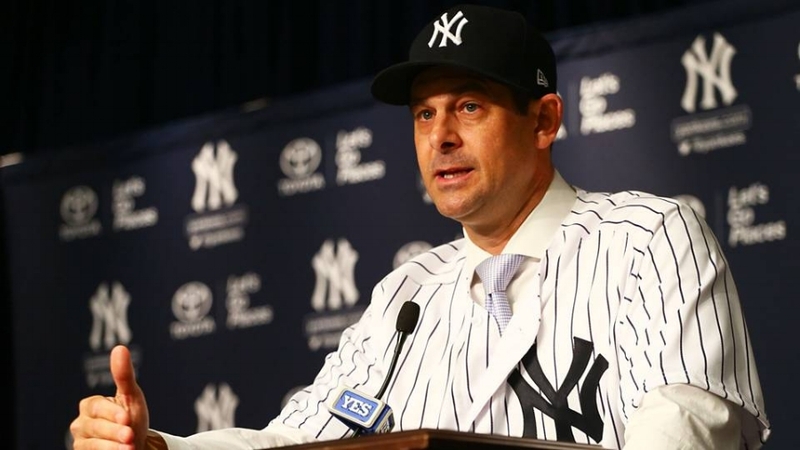 Why are we just assuming that Aaron Boone is going to transition seamlessly into his role as Yankees manager? I like Boone. He seems like the exact type of manager you want running your team these days. He played the game. He's young. He's good with the media. He's open to analytics. Long term this could be a great hire, especially once he gets through the growing pains. I just think it's fair to wonder whether that'll happen right away. Boone has never managed before. He has never even coached before. He's been in the broadcast booth since retiring in 2009. His bench coach, Josh Bard, doesn't have much experience either. Maybe it's not an issue. Maybe this Yankee team is so stacked and has so much chemistry they'll cruise to the division. My point is just that there are enough things to QUESTION about NYY to not give them the division just yet. Expectations, an underrated shaky rotation, possible offensive regression, and a new manager? The Sox are more than talented enough to make it three division titles in a row in 2018.